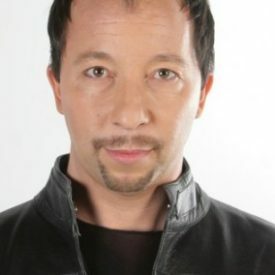 DJ BOBO (whose real name is René Baumann) is a producer, composer, writer, singer and dancer in one person. After having graduated from high school René decided to become a confectioner’s and baker’s apprentice (1984). In 1987 he reached the top 10 of the German “Disco Kings’” with his acrobatic dance style. In Switzerland he even won the Swiss Championship in showdancing. In the 1985 DJ BoBo began his career as a DJ. Only one year after that he was runner-up in the Swiss DJ Championships. The first DJ BoBo single I Love You was created (at the end of 1989). This was followed by the first DJ BoBo tour which led him through various Swiss discos. After the two singles Ladies In The House (1991) and Let’s Groove On , there also was a second (clubs) and third (small arenas) DJ BoBo Swiss tour. He had finally his breakthrough with the smash hit Somebody Dance With Me : It became a number one in the Swiss Single Charts in March 1993. Being in the top 10 in many countries all over the world, his extraordinary success was rewarded with a Golden Record in Germany, Austria and Switzerland as well as in Israel and Australia. With his second hit Keep On Dancing (summer 1993) DJ BoBo proved that he was not only a so called ‘one hit wonder’. The long expected album Dance With Me was awarded a platinum record in Switzerland and remained in the charts all over Europe for quite a while. The single Take Control went gold in Germany and reached top positions in the charts of many countries. In the summer of 1994, DJ BoBo had a big hit with the single Everybody which climbed up to number 2 in the German Single Charts, stayed there for many weeks, and was awarded a platinum record for 500,000 sold units in Germany. In the fall of the same year the second album There Is A Party was released containing the smash hit Let The Dream Come True which reached gold, too. In January 1995, Love Is All Around was released; it reached top 10 positions in many countries all over the world, and in Germany was awarded with the sixth Golden Record in a row! 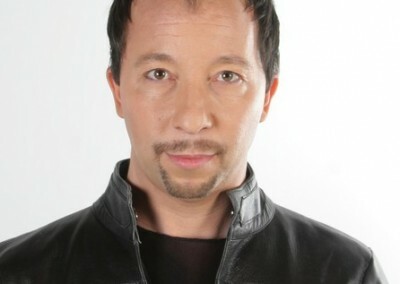 Within the scope of his tour in South America, which took place in February and March, DJ BoBo earned great response from his fans. The summer hit There Is A Party also went storming through the charts, accompanied by the fantastic video which was shot by the Miami Vice camera team. In the summer of 1995, DJ BoBo went on a tour which led him through most parts of Asia. Among other locations he also performed in the Olympic Stadium of Seoul. Then he did a promotion tour in Australia. Later that year DJ BoBo traveled all over Europe (this time accompanied by 25 technicians with extremely fancy tour equipment), fascinating more than 400,000 spectators with his new live crew of eight people and a perfect choreography. On 14th January, 1996, DJ BoBo introduced his first ballad Love Is The Price in Thomas Gottschalk’s TV show ‘Wetten Dass. . .’. In March he began his first tour in Switzerland with more than 40,000 people to enjoy ten concerts in ten days were the “Backstreet Boys” were special guests! Freedom was another DJ BoBo single to be awarded gold in Germany, which made him a record holder in Germany as he was the first artist in the field of ‘Dance’ Music who received eight Golden Records in a row. In the summer of 1996 DJ BoBo and his crew started the organization of the gigantic ‘World In Motion’ tour. This show, a glamorous and mixture between musical, concert and show topped all expectations. While DJ BoBo was still working on new songs (all in all 31 songs were composed; net working hours in the studio: 1054, without writing lyrics and composing), the preparations for the conception of the stage as well as the booking of the concert arenas was in full progress. For the video for Pray a stage was especially set up, and about 1000 fans were invited as audience. On Michael Jackson’s ‘History tour’ DJ BoBo and his crew were able to show their skills as support act at his concerts in Prague (160,000 people), Bucharest (35,000 people), Moscow (70,000 people) and Warsaw (70,000 people). For DJ BoBo a dream came true. However, at the same time this was a very busy period in everybody’s lives as those concerts simultaneously took place with DJ BoBo’s World In Motion European tour (about 27 concerts in Europe’s largest arenas) were ‘N SYNC were special guests! With the release of the album World In Motion at the end of September 1996 he broke all previous records. In only three weeks it achieved position three in Germany and was awarded Platinum for 500,000 sold units. In Switzerland it even leaped from 0 to 1 and was awarded Double-Platinum (100,000 sold records)! Then he went on promotion tour in Asia for twenty days. What is certainly worth mentioning here, is his appearance in Guangzhou (China) as he was the first Western artist to perform there. In March 1997 DJ BoBo and his crew went on tour in South America (Brazil, Chile, Colombia) for one month. With their performance on the biggest TV show in Brazil they reached more than 25 million people. Right after this the video for the single It’s My Life was shot on one of the most beautiful islands in Venezuela. On account of the enormous demand an additional tour of the World In Motion show was organized. One more time it led DJ BoBo and his crew to more than 20 arenas in Europe. In July 1997 the fourth single of the CD Shadows Of The Night (with the brilliant insertions of the Vienna Symphonic Orchestra) was released. In September 1997 a special winter edition of the CD World In Motion was made available containing the unreleased songs Can You Hear Me and the Queen remix of Radio Gaga . At the end of March 1998, he released the long expected single Where Is Your Love . For the first time now he was able to show his singing skills, too. The video, full of the latest technical gimmicks, was shot at an old castle in Germany. All in all (rehearsals and video shooting) it took four days to realize this video. At the end of April, finally, the so far most emotional and diligent CD of DJ BoBo was available: MAGIC! The album which was equipped with a flashing red light on the cover (limited LED edition) broke every single record. Right after it was out in the stores it leaped right from zero to one in the Swiss Charts and remained there for more than four weeks. Even while still on the World In Motion tour, DJ BoBo and his crew began planning the new Magic show. The stage, which could miraculously be turned into various sceneries, was a construction of magic dimensions: 24 m in width, 14 m in length, an additional cat walk of 15 m with a 32 m² dancing area at its end. As the Magic show’s premiere was so successful in August 1998, the ‘life on tour’ started again for DJ BoBo and his people. The gigantic show, a mixture between concert and magic, was performed in 35 concert arenas in Europe. All in all 250,000 people watched it! At the same time DJ BoBo released the third single of the Magic album: “Celebrate” (October 1998). DJ BoBo and his crew had already begun planning the upcoming show a long time ago, they went on the Magic open air tour in June 1999 one more time, and performed the successful show again (five times). Although his succes story has not come to an end, after 1999 he did very big shows (even Las Vegas) with lots of music and dancing, his internationally most important, successfully and recognised music period was 1992 up to 1997.